Portage Park District and Western Reserve Land Conservancy have permanently conserved nearly 200 acres in Portage County. 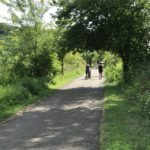 The organizations partnered in leveraging grant funds to permanently protect 189 acres of high quality natural areas in the City of Streetsboro, an area under continued development pressure. The project, referred to as the Tinkers Creek Greenway, is comprised of two separate tracts of land: the 59-acre Beck tract acquired by Western Reserve Land Conservancy then transferred to the Portage Park District, and the 130-acre Gressard tract acquired directly by the Portage Parks, who will develop and manage it as a public park. 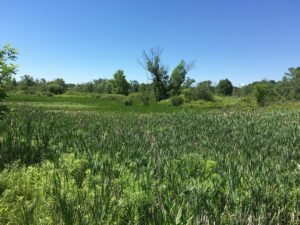 The 59-acre Beck property largely consists of high-quality wetlands, including approximately five acres of fen wetland habitat. Fens are fed with mineral-rich groundwater and are noted to have a high diversity of native plant species. 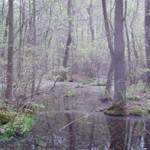 Natural resource surveys of the property, conducted by the Cleveland Museum of Natural History’s Natural Areas Program, revealed some 295 species of flora and fauna, with 16 dragonflies and damselflies. The 130-acre property was a part of the estate of the late William Gressard, longtime nature columnist for the Record-Courier and passionate conservationist who originally dug the lake for his family’s fish farm business. The Gressards’ children, Gwen, Bob, Bill (Cheri) and Richard are thrilled that it will be parkland. Robert Fageol Gressard shared his thoughts, “The creation of this park is due to the vision of those who could see what a great asset this would be for Portage County and the residents. I hope all who visit will enjoy the new park.” It’s also a critical buffer to the adjacent Herrick Fen State Nature Preserve, which is home to several rare and endangered species as well. “This project provides tremendous value to the community—by protecting rare and important ecosystems, protecting water quality, mitigating stormwater and creating a beautiful new public park for all to enjoy”, remarked Christine Craycroft, Executive Director of Portage Park District. Over the next year the park district will be inviting the public to participate in planning for the new park site which includes woods, fields, wetlands and a 30-acre spring-fed lake, previously used as a commercial fishery. Possible opportunities listed by Craycroft include hiking, fishing, kayaking, picnicking, primitive camping and educational programming. The public can stay up to date on the planning process by visiting the park district’s website and signing up for the e-newsletter. As with many park and conservation projects, the partners secured funding from multiple sources. 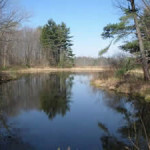 The Land Conservancy’s tract was generously funded by the Ohio EPA (OEPA) through the Water Resource Restoration Sponsorship Program (WRRSP), with the Northeast Ohio Regional Sewer District (NEORSD), being the sponsor in this case. 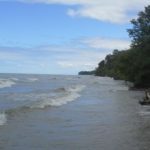 The goal of WRRSP is to counter the loss of ecological function and biological diversity that jeopardize the health of Ohio’s water resources. Szell said the WRRSP “is an extremely valuable funding source” to protect natural resource-rich properties like this one. Portage Park District leveraged the OEPA funds as local match for the park district’s Clean Ohio Conservation Fund grant, along with funds from its voter-approved levy, to secure the 130-acre Gressard Tract. The landowners even helped out by selling the property at below market value.